Coleman are American manufacturers of simple but very functional analogue audio switchers, meter units and passive monitor controllers. We've already reviewed the M3PH MkII and SR5.1 MkII in the pages of Sound On Sound (SOS March 2006 and April 2007, respectively), but the latest addition to the fold is the QS8 Master Monitor Control unit. This new model is a multi‑function device that serves as a stereo passive monitor controller and also has a built‑in engineer's headphone amp, an integrated artist cue facility, complete with talkback and, rather unusually, an analogue stereo summing mixer that accepts four stereo inputs. All this comes in a smart 1U rackmount case! As with all Coleman monitor controllers, the principal control-room monitor path is entirely passive, with the balanced signal passing through high-quality switches and a rotary switched attenuator that provides an accurate, stepped level control. The lightly detented switch positions provide roughly 2dB steps over the top half of the range, from unity down to ‑34dB of attenuation. After that, there are 4dB decrements down to ‑50dB, then a 10dB jump to ‑60dB and, finally, an 'off' position providing 105dB of attenuation. The tracking accuracy is superb across the critical top half of the range, with less than 0.05dB between the two channels. The channel crosstalk varies a little with the attenuator setting, but is typically around ‑80dB (10kHz, 0dBu test signal). In normal operation, the monitor path can be derived from one of two stereo inputs (Aux 1 or Aux 2), and the selected signal is routed to either the main or alternate speaker outputs, all selected via front-panel push-buttons. The two stereo Aux inputs and the two stereo speaker outputs are all connected via rear‑panel XLRs. The QS8's monitor path controls aren't laid out in the most logical or intuitive way, perhaps, but work well enough in practice. The controls are neatly laid out on the front panel, and all the I/O is hosted on the rear.The passive signal path means that there are no active electronics to add noise, distortion or tonal colouration, of course, and, provided that connecting cable lengths aren't excessive and the source and destination impedances are within the normal range, this solution is about as accurate and transparent as is possible for a monitor controller. The rest of the QS8's facilities are all mains powered, and the unit has a captive mains cable that exits from the back of the right-hand panel. This is a common feature of Coleman products, and while it's not normally an issue, it can make installation in a tight rack frame difficult in some cases. An on‑off rocker switch on the front panel powers the unit, although there is no power‑on indicator, which is a shame. There is no external voltage selector or mains fuse, and no indication as to the equipment's voltage rating — something that would theoretically force an instant PAT fail! Starting at the left of the control panel, the built‑in headphone amplifier is equipped with a rotary level control and a quarter‑inch TRS (stereo) output socket. The headphone output is normally the same as the selected monitor path source, but a push‑button allows the artist's cue-mix output to be auditioned instead, to check what the artist is hearing. Consequently, the headphone facility could serve as a convenient cue source for an artist performing in the control room, if required. The artist's cue section dominates the centre of the control panel. Its principal source is a stereo balanced cue input (on quarter‑inch TRS sockets on the rear panel), the level of which can be adjusted with a rotary level control that provides unity gain when fully clockwise. This signal would normally be a rough mix or backing track derived from the DAW to which the artist is recording. Alternatively, a push‑button allows the cue input to be replaced with the monitor path's selected signal source instead. The balanced cue output signal is dispatched via another pair of quarter‑inch TRS sockets and is intended to feed an external headphone amplifier. A rotary master output-level control (Cue Mix Level) provides unity gain when at the 12 o'clock position, and +16dB gain when fully clockwise. A second source, labelled Aux 3 (and connected via a pair of XLR sockets on the rear panel) can be combined with the cue input. Again, this source is equipped with a rotary level control (unity gain when fully clockwise), as well as a mono button. This additional cue-mix input is intended for latency‑free source monitoring, and the idea is that the artist's microphone preamp output is split to feed both the Aux 3 input for direct monitoring, and the DAW interface for recording. In this way, the artist can hear their own performance without latency, and with the ability to balance their own level against the cue-mix track from the DAW. 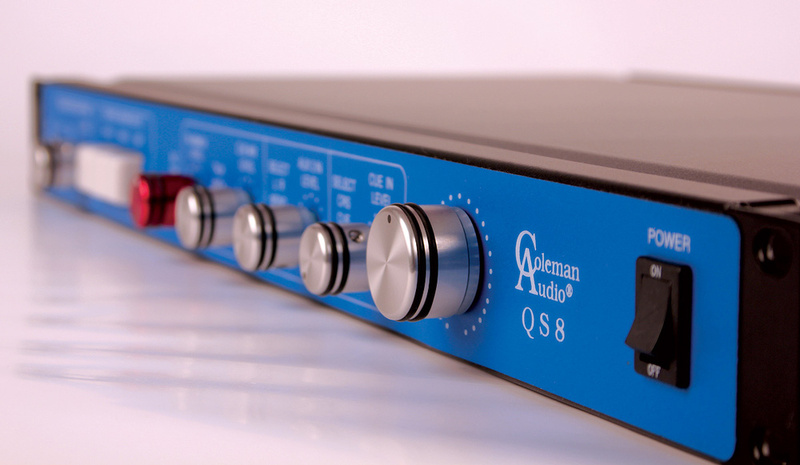 To aid communication with the artist, the QS8 also includes a talkback facility with a volume control and a non‑latching, click‑free activation button that routes the talkback signal directly to the Cue Mix output. An external talkback mic is provided in the form of a large plastic disc (roughly 5cm in diameter and 1.5cm thick) with a long cable terminated in a 3.5mm mini‑jack. This is plugged into the corresponding front-panel socket and allows the mic to be placed in any convenient position. I found there was plenty of gain available to ensure that talkback messages were clearly audible. Two more 3.5mm sockets on the rear panel are used to accept an optional footswitch for remote talkback operation, and to provide the talkback mic output for use as a slate mic feed if you want to record talkback to a dedicated recorder track. The most unusual feature of the QS8 is that it can be used to sum four stereo inputs into a dedicated balanced stereo mix output. The four QS8 inputs (Aux 1, Aux 2, Aux 3 and cue input) are combined with the resulting mix made available on another pair of XLRs, labelled Mix Output. A Mix button in the control-room source selector section enables the mix signal to be auditioned. The Aux 3 and cue inputs to the summing section are derived after their level controls (and Aux 3's mono button), enabling these sources to be balanced against Aux 1 and Aux 2 (which both have a fixed gain, of course). However, if Aux 1 or Aux 2 is being monitored in the control room, its signal is removed from the summing bus. The summing output is available at all times and can be used as a second cue-mix section, if required. On the test bench, the summing-section electronics were able to accommodate input signals up to +22dBu via the Aux 1 and Aux 2 inputs, although an input level of +24dBu (the default for many pro D‑A converters) caused severe clipping distortion. Strangely, the signal‑to‑noise ratio measured 102dB for the left channel and 114dB for the right for both Aux 1 and Aux 2. Both are good figures, but the disparity is intriguing! Testing the Cue In and Aux 3 inputs, I found that the headroom margin was much lower, with obvious overload distortion for input levels above +12dBu. The signal‑to‑noise ratio for these two inputs to the summing Mix output was 104dB on both channels. In general, I'm quite a fan of Coleman products, but there's almost always something that I find a little frustrating. In this case, it's the absence of any front‑panel indication of the mains power status, and the very odd headroom margin issues with the summing system. Nevertheless, the QS8 is an interesting product with some unusual and useful design features. The limited headroom on the Aux 3 and Cue inputs to the mix bus makes the summing element of the design rather less useful than it should have been, but in every other respect this is a very clean and capable performer. The QS8 isn't a cheap monitor controller option, but it is very clean and transparent, and does pack some handy features into a very compact space. The most obvious direct competitor, with a passive control-room monitor path and broadly equivalent artist cue facilities, is the Presonus Central Station, although that model doesn't have any summing facilities. Another contender with good artist cue facilities, but with a high‑quality active monitor chain, is the Audient Centro. The Dangerous Music D‑Box has less flexible artist cue facilities, but does include a summing mixer and has built‑in D‑A conversion for digital sources. High‑quality switched attenuator in main passive monitor path. A/B source and 'alt' speaker switching. Second input to artist cue system, to facilitate zero‑latency source monitoring. External talkback mic for convenient placement. Summing-section headroom issues on some inputs. A well-equipped passive monitor controller with added value features including artist cue facilities and talkback, and a basic summing mixer thrown in for good measure. The design has some quirks that may limit its application in some cases. Coleman Audio +1 516 334 7109.